Oxford University Press, USA, 9780190494957, 344pp. As you age, you may find yourself worrying about your memory. Where did I put those car keys? What time was my appointment? What was her name again? With more than 41 million Americans over the age of 65 in the United States, the question becomes how much (or, perhaps, what type) of memory loss is to be expected as one gets older and what should trigger a visit to the doctor. - What are the signs that suggest your memory problems are more than just part of normal aging? - Is it normal to have concerns about your memory? - What are the markers of mild cognitive impairment, dementia, Alzheimer's, and other neurodegenerative diseases? - How should you convey your memory concerns to your doctor? - What can your doctor do to evaluate your memory? - Which healthcare professional(s) should you see? - What medicines, alternative therapies, diets, and exercises are available to improve your memory? - Can crossword puzzles, computer brain-training games, memory aids, and strategies help strengthen your memory? - What other resources are available when dealing with memory loss? 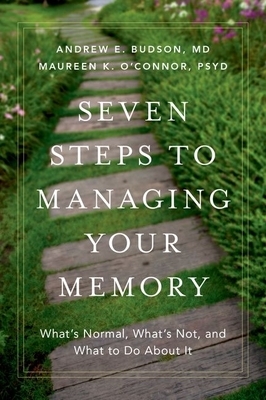 Seven Steps to Managing Your Memory is written in an easy-to-read yet comprehensive style, featuring clinical vignettes and character-based stories that provide real-life examples of how to successfully manage age-related memory loss. Andrew E. Budson, MD, majored in chemistry and philosophy at Haverford College before receiving his medical degree from Harvard Medical School. Dr. Budson is Professor of Neurology at Boston University, Lecturer in Neurology at Harvard Medical School, and Chief of Cognitive & Behavioral Neurology at the Veterans Affairs Boston Healthcare System. His career combines education, research, and clinical care to help those with memory disorders. Maureen K. O'Connor, PsyD, was educated at Ithaca College, Indiana University of Pennsylvania, and Yale University School of Medicine. Dr. O'Connor is Assistant Professor of Neurology at Boston University, Director of Neuropsychology at the Bedford Veterans Affairs Hospital, and Member at Large of the National Academy of Neuropsychology. Her award-winning research, education, and clinical care focuses on patients with memory disorders.